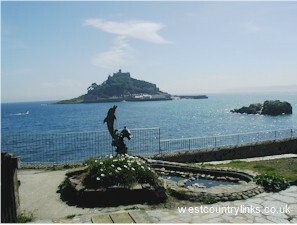 Cornwall Links for holidays, accommodation, events and attractions. Cornwall is one of the favourite holiday counties in England because of the great variety and beauty of its scenery, which ranges from the rugged to the pastoral. Cornwall is a long peninsula of stern granite moors, jagged cliffs and raging seas contrast with quiet coves, tiny villages and gentle valleys, and there are also many fascinating relics of the past such as dolmens, stone circles, forts, and the more recent disused tin and copper. mines and china clay works. For holiday accommodation we have many hotels to choose from, if self-catering is required we have caravan and camp sites also holiday property, cottages and houses available in the South West. Use our maps or look in the Towns and Villages for more local information on the area. We have wonderful places to visit, links to attractions and days out, Eden's gardens are the most popular at the present, but we have many more, look under where to go. View your accommodation before you book from quite guest houses, luxurious hotels, to Grand Manor House in the towns or countryside, we have placed lots of country clubs within this section as the properties within the grounds are available for anyone and they do have such wonderful scenery. For self-catering, there are many caravan and camp sites to choose from in woodland or near the beach and sea. In the West Country you will find a variety of golf courses with accommodations within the grounds. A night out in the South West gives such a variety quaint old worlde pubs lurk around every corner mouth watering food in many guises awaits customers at the various restaurants either in town or country. Cycling, Fishing, Golf, Boats, Railways, Scuba Diving, Surfing, Balloons .